(Feb. 5, 2015) -- The UTSA Department of Art and Art History will present the exhibit "Fare Thee Well" through Feb. 20 at the UTSA Arts Building Art Gallery (2.03.04) on the Main Campus. “Fare Thee Well,” curated by Clay McClure and Connie Swann, explores iconography deeply rooted in the Southern landscape, fetish objects and collective memory. Artists featured in the exhibit include Robbie Barber (Waco), Ben Davis (Denton), Dyan Green (San Antonio) and Sedrick Huckaby (Arlington). Robbie Barber’s architecture-related sculptures are influenced by his travels throughout rural America. He is attracted to the strong visual character of this country’s vernacular architecture. Vintage lap-board houses, mobile homes and agriculture-related structures have become regional icons that ultimately tell the stories of their inhabitants and builders. Typically considered eyesores, these structures are glaring reminders of the social and economic plight of much of our society. Yet on a formal level, they have a hidden beauty, complex in color, texture and shape. Much like America’s Ashcan School, Barber is interested in the depiction of unheralded everyday subject matter and the subtle nobility in these castles of the mundane. Sedrick Huckaby's large-scale paintings explore the artist's personal history and African-American roots. Huckaby's subjects are family members and neighbors; their portraits are close-up, focused on their faces. The paint is thick and vivid, offering a complex exploration of features and their importance to the artist. Dyan Green's creative process is "an investigation and a dialogue with the tangible and intangible aspect of items left behind." Green repetitively stakes sewing ball pins onto antique objects and pillow-like sculptures creating delicate patterns and textures on the surface. These pins and patterns envelop objects like a cozy blanket and at other times like the beauty of cells dividing under a microscope. Ben Davis’s work investigates the social experience of architecture by documenting the historic structures that have accommodated cultural rituals for more than 150 years in Texas. Davis uses traditional photographic methods as well as contemporary digital technology. Davis is currently working in conjunction with the Gregg County Historical Association to document antebellum homes in East Texas for a book publication. He makes frequent excursions to East Texas to document the region’s remaining vernacular buildings and to maintain relationships with friends and family in the region. 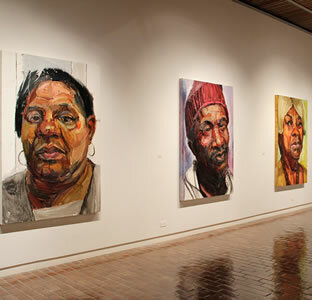 UTSA Art Gallery hours are 10 a.m. to 4 p.m., Tuesday-Friday; 1 to 4 p.m., Saturday and by appointment. Exhibitions are free and open to the public. For more information, contact Laura Crist at 210-458-4391.